Post and discuss your team this pre-season. See the top 100 players selected in the Drawing Board. 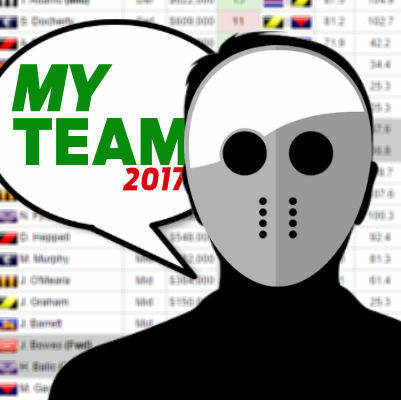 The 100 most popular players selected in the Drawing Board for AFL Fantasy Classic. As at 4 January. This is the team I’m running with at the moment. It may be a bit deep in the Mids but I just like having those names there! It is a bit deep in the mids, but not overly so. Personally I think your backs are a shade weak. You have three premos, but they are not the greatest premos based on last years performances. If if was up to me I’d downgrade JOM to a rookie and use the money to take Hibberd to one of the 100+ averaging guys like Shaw, Docherty or Simpson, but I suppose if you really think JOM will smash it then go for it. I’m assuming Smith in the forward line is Devon Smith, which is an unusual pick. I don’t know enough about him to say whether it’s bad or good, but it’s certainly unique. With Rocky, Barlow, Beams and JOM in that midfield who were all injured at times last year, and Heppell coming back from a year out of the game, personally it’s too risky for me, and you’d want to be sure they are all 100% over their injuries before picking them. Brilliant review and feedback mate! Thanks. It’s Isaac Smith up fwd, not Devon. liking the different things going on, dunno about k.mutch and at work so cannot research, can you give me a heads up? I was lucky enough to see kobe mutch at the national carnival for NSW and he was a gun against div 2 sides and was named in the allies. He averaged around the 25 mark for disposals, so if he can get a game he’ll probably be in my side. As for Tippy and murph, Tippet has looked like hes found his spot having a run in the ruck and kicking goals down forward, i personally think hes the best ruck at Sydney if he stays fit. Is 558k too much money to have in the bank when going into round one? And if so, how much money is too much? Thats a fair amount of cheddar. Really depends on what your team looks like and how many keepers you start with, it can work in your favour. Id say you wouldnt want to much more than $200K in the bank tho. Yes, it is. To put that in perspective, Dyson Heppell is about $540K in RDT, so that’s not just money you’re leaving on your bench, that’s a whole Dyson Heppell you’re leaving out of your initial team. Remember, each player is priced at what they averaged the previous year, or are expected to average, so instead of saying, “We have $11 million to spend on our Round 1 teams,” we can think of it like “We have X points to spend on our Round 1 teams.” I know it is tempting to load up on rookies and make cash early, but leaving money for upgrades like that just seems foolish to me, because you’ll be so far behind right from the start. Will go with same Ruck combo. Adams will be upgrade target for me, Rather spend that money on an under priced mid who should play 22 games and Average more. L.Neale with Fyfe coming back “could” hurt is output. Has the ability to pay huge dividends. This year I am of the opinion you can only start with one of danger/rocky otherwise it creates weakness elsewhere. Isaac Smith could go bang this year. Interesting picks with Lloyd, Menegola and Longer – do you know something we don’t? As a Crows fan, I’m telling you Otten won’t come into calculations unless 2-3 injuries occur. I really hope Bennell has a great NAB, he’ll be a good get. Roughead could come in too if he smashes pre season. I think you need to switch your R2 to a more solid choice like a Sandi? Menegola down to a rookie who’ll play and upgrade maybe Otten to a Thurlow? More concerned about B.Waters and N.Bock BTH.. This thing has been out for 5 days and you’ve made 36 teams, probs more since 7:14pm tonight. Do you have a life or is dream team your job? RDT team picker has been open for Gold members for 3/4 weeks now. Fantasy Maybe since they ruined the game have lost interest. Which Hawk is gonna be tagged by opposition teams? T. Mitchell? I. Smith? Or do u think no one will be tagged? Could be later than that if the knee flares up in the VFL on his comeback trail. Brief little first crack to see how the new cap feels. Currently very generic as it’s a bit too soon to get some big personal wants, and it’s quite dependent on quite a few r1 rooks, but does the job I think. KK is mostly out of lack of cash, I could get better players for his price in other positions, but my backline is down to three without him. Rooks are subject to Jeppa. Planning on starting freeman on the field, you are crazier than most. As I said rookies are a mile off, reports/performances/availability will decide that when we’re closer. I get that, but I quite like the massive top end there, I don’t believe any of the 60k less guys are capable of matching them myself, I see them as a clear top two who will be 10-15 clear of the pack all year, but that’s just me. Historically I’ve always been the “never start with the top price guy” because I never trust anyone to back up, but for whatever reason I’ve got gut feel going for it this time. I definitely see the appeal of getting KK upgraded, Don’t think I’ve ever held him 8 weeks in succession to even get him to his bye haha, also considering Heeney to Bennell (if injury news stops looking horrible) or something like that to get the KK cash. Thanks for giving some areas to dwell on for the pre-preseason anyway. I think its worth backing in the guns. Set and forget no mini upgrades needed. They are that price for a reason. Quick swap with Freeman to Barrett and its fine. Whats the buzz around Thurlow? Is he taking Enrights spot racking up easy +6s? I was looking at that ruck combo to, mid priced should make cash and score 85+ you would think assuming Ryders role is solo ruck. Which is the weakest line? could go Johnson to a premo in the backs, I’m liking the other back rooks more. Billings has the potential and from what I understand he is having a good preseason which I dont think he has had before. POD for sure, might be worth the risk. Daicos is a spot holder, I doubt he will start round 1 Ill have to wait and see I guess. Redden and Scott Selwood, or Tithcell and a 150K rookie like Freeman/Graham on the field? Mids are elite which I believe has weakened the forwards slightly. Having said this if Billings, Heeney & Elliot all go bang you will be in outstanding shape. wow, can’t believe I’m looking at Gablett as a POD. Could be the master pick of the season, haven’t seen him in any other teams. Stacked the midfield at the expense of the forward line. Would have loved to squeeze T.Adams in but was out of cap space (went for Docherty instead). Might bring in Heppell for one of the midfield premiums to free up a bit extra cash. Do you really trust gaz anymore? I can’t get my head around it after 2 years of getting burnt and the decline as he ages. Saying that i could eat my own words if he has a stellar season. Now you can only have 1 player from each team and Dangerfield and Rockliff can’t be in your Top 8. How do you fins out the expected Expected Total and the Site Expected Total?